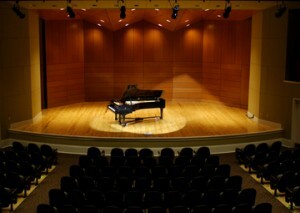 The east and south wings of the music building, along with the David H. Nutt Auditorium, were completely renovated between 2000 and 2005, when the music department moved into the building. The west wing of the building began renovations in January 2014. The building, including classrooms, studios and department offices, was completed in July 2015. 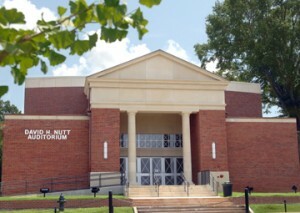 The David H. Nutt Auditorium, is the primary venue for student and faculty recitals. Our former department headquarters, Meek Hall, contains the newly renovated Meek Auditorium, used for opera productions. Major musical and theatrical events are held in the 1174-seat performance hall of the Gertrude Castellow Ford Performing Arts Center, completed in 2002 and located at the eastern end of the Oxford Campus. The Paris-Yates Chapel, completed in 2001 with private funding by the Paris family of Indianola and other donors, seats about 200 persons, and contains a classic two-manual pipe organ of traditional design by Canadian organ-builder Karl Wilhelm. Adjoining the chapel is the bell tower donated by Marge and Frank Peddle of Oxford, containing a carillon of thirty-six bells from the Petit and Fritsen foundry in the Netherlands. The music library, which contains scores, recordings, videos, and computer software as well as reference books and periodicals, is currently housed with the John D. Williams Library. 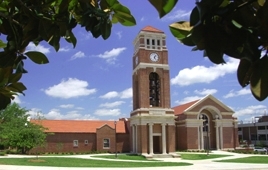 The University of Mississippi Blues Archive is housed in the library’s department of Archives and Special Collections.